Please allow me, Andrew Davenport, to tell you a story. Our garden used to be mainly lawn and, lovely though it was, I found myself a slave to the lawnmower at the expense of what I really wanted to do – gardening! So slowly the lawn disappeared as I dug up more and more turf and the flower borders took over. 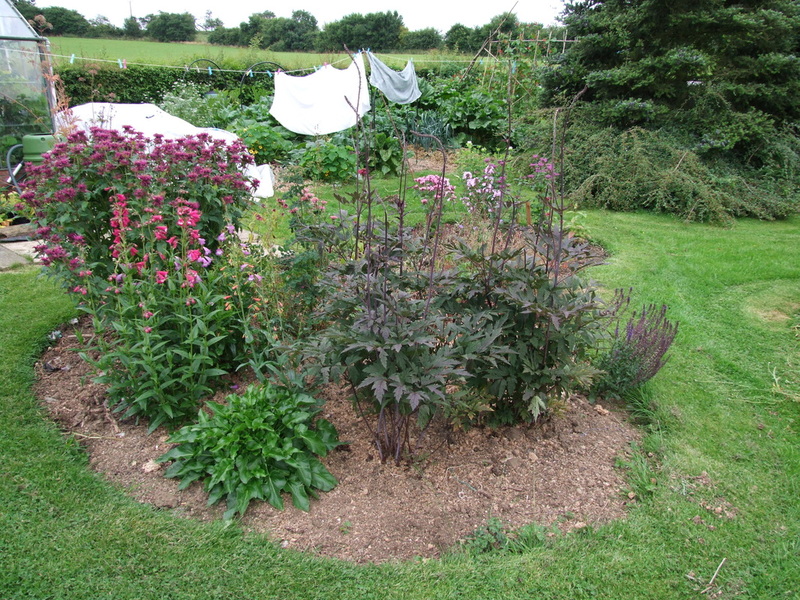 It was backbreaking work and persistent weeds were tiresome to eradicate in the new beds. 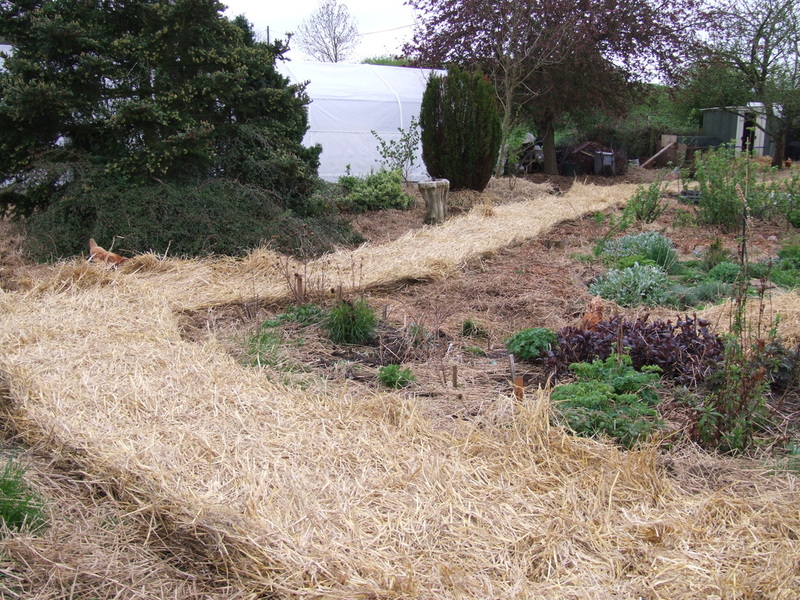 For a few years now, I have been routinely spreading barley straw around my veg plot on the pathways to keep the weeds down and very well it worked too. In fact so well that I often noticed where it had touched upon the lawn, the grass had completely died back. The divide was very distinct and was like the grass had never been there, even though the straw had only been down a few months. As an experiment, I decided to apply a thick mulch of straw on the grass where my next new bed was going to be. A 4” (10cm) layer was spread from a large round bale I had delivered from our local farmer. £15 for a large round bale dropped over the hedge. Roll it in to position then take off the webbing. The straw can then be unrolled incredibly easily like unfurling a carpet, leaving a very neat, thick, wide layer. A few months later I had my next new bed ready for planting. Stones were placed to form the perimeter of the bed. This was to be my new fruit bed so blackcurrant, redcurrant and gooseberry were planted through what was left of the straw. Amazingly, all the grass and weeds had been destroyed beneath the straw including dandelions, couch grass, creeping buttercup and yarrow. The fruit bushes thrived and gave us (and the birds!) bountiful crops. Applications in other areas have eradicated ground elder. The action of the straw also appears to kill off or inhibit most weed seeds present in the area. My theory on its action is akin to its use in ponds to kill off algae. Tannins and possibly other plant inhibiting chemicals are released in the decomposing process and it may well be that these cause the weeds to succumb. I stress here that barley straw is the only type of straw to use for this purpose. All this marvellous mulching means we have vast amounts of the gardener’s best friend – the earthworm. Other creatures have enjoyed the straw too, including field mice and voles. In turn this has attracted their predators such as weasels, owls and other birds of prey. In effect, wildlife corridors have been created and with the attracting qualities of the additional planting for pollinating insects and many other invertebrates, the bio diversity in the garden has rocketed! Furthermore, the moles don’t bother me anymore because they have no grass to spoil and their annoying earthworks tend to stay under the mulches. Marvellous! I can’t wait to get planting in the spring where my new borders will at last be free from weeds and their seeds. These borders and paths will really become low maintenance with the continued application of a good mulch about once a year. In effect Barley straw can kill most types of weeds, I wont say all because I haven't tried it on all types of weeds (I should say plants because as we all know, a weed is simply a plant growing in the wrong place) or plants and some plants may show resisistance so dont expect it to perform miracles on your japanese knotweed which has a vast root system extending up to 2m below ground. What has been proven is that barley straw is a fast, effective, easy to apply, cheap, organic method of killing weeds and clearing areas of planting ready for alternative usage. Barley straw is a first rate weedkiller suitable for use in organic gardening. It has saved me masses of work, saved vast amounts of time and saved a considerable amount of money in clearing my garden. On the Gardeners Question Time programs on 19th and 21st of December from Dalston near Carlisle, I raised the topic of killing weeds with Barley Straw. This received some interesting view points from the panel. I am extremely pleased that GQT allowed me to ask the question on the show and really appreciate the comments that were raised. Overall the panel were positive about the use of the straw as a mulch and the concerns and thoughts raised were certainly those that have been through my own mind, I would however like to respond to some of the comments from my experiences that have been gained over the last few years. The panel were concerned about nitrogen deficiency in the soil. In response to this, the straw is usually almost completely broken down in a few months so it actually starts to add nutrients in the form of humus created by the soil life that are attracted to and thrive at the interface between soil and straw. 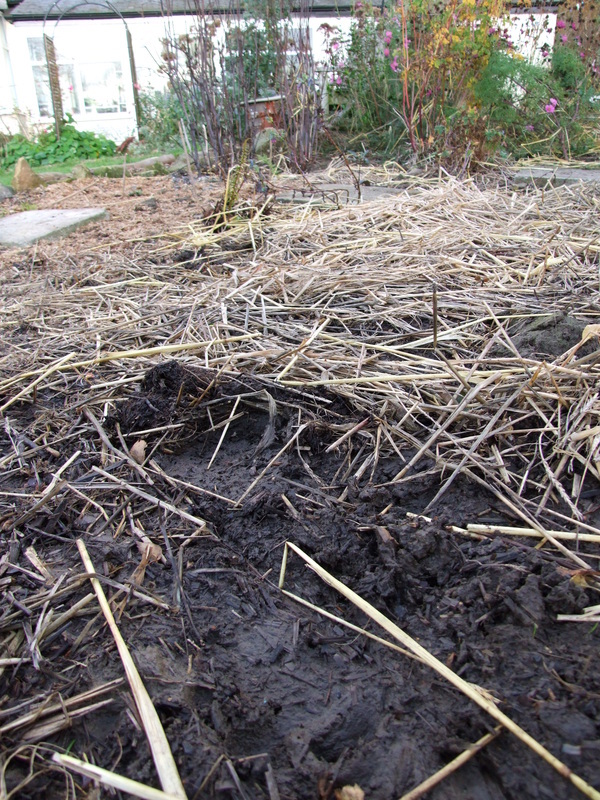 The straw (even though it is almost fully decomposed) is never dug in and is allowed to stay on the surface continuing to be of benefit as a mulch. For planting, the soil is simply moved apart to reveal the bare earth beneath ready to plant in. No noticeable nitrogen deficiency has been noted in the plants grown. All have thrived. In response to this, the straw usually rots down in 3 months so although light suppression may have an initial role, decomposition of the straw starts to allow in more light. Also the weeds are totally destroyed and completely vanished in 3 months where if it was light suppression only then they would probably still be in existence searching for light. My theory is that plant inhibiting chemicals are released during decomposition of the straw including tannins and lignins and possibly others which are lethal to the plants. Some of the panel were of the opinion that straw is expensive. Yes of course if you were to walk into tesco and buy it you would be extremely alarmed at the cost to clear a few sq metres of weeds. However, if purchased from a farm locally then it is reasonably cheap at 15 to 20 quid for a large round bale delivered which will cover over 60 m sq. A small square bale will cost 2 to 5 quid and will cover about 5 msq. Admittedly not everyone lives near a farm so transportation costs would need adding to these prices if distance is an issue. 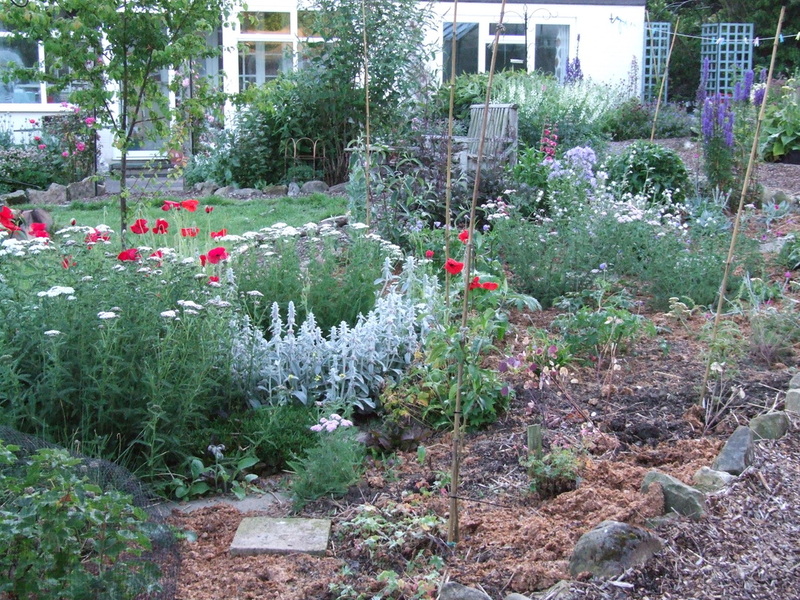 This is how the garden used to look, mainly lawned with a few island borders. The grass and weeds were well established - you can see the weeds encroaching into the border which require continual control of the lawn edging. The straw has been laid out around the lawn in the entire garden. Round straw bales are rolled out to leave a 4 to 6 inch layer. The view looking back towards the house with the straw pulled back to reveal bare dark soil ready for planting. THis picture was taken 3 months after the application of the straw. One year later and the garden has been planted up, now kept free from weeds by further mulching.